Broughton has neither church nor chapel in the village itself. But is is part of the Street Benefice which covers four parishes, each taking its turn to host church services. St Helen’s Church, Amotherby, the daughter church. South aspect of Amotherby Church. 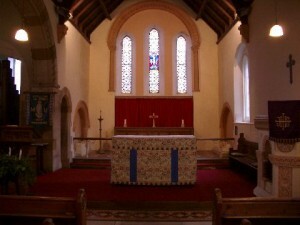 Closest physically to Broughton is St Helen’s, Amotherby which stands almost hidden in a churchyard screened by trees. It is the daughter church, considered a chapel of ease to the mother church, All Saints’, at Appleton-le-Street. Little now remains of the original Norman building. 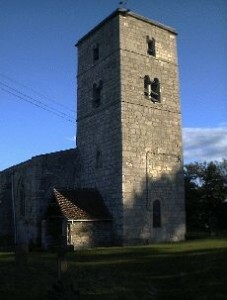 The tower dates from the 15th century and the present form of the church dates mainly from 1871. This is when the nave was rebuilt and the north aisle added. At the time of rebuilding the original font was removed and now stands outside near the porch. Of particular interest is the 14th century effigy of Sir John de Bordesden. Its churchyard is known for being a Conservation churchyard. All Saints’ at Appleton-le-Street, the mother church. All Saints’ at Appleton-le-Street is a Grade 1 listed Saxon church standing on high ground above the village looking out over the Vale of Pickering. It escaped the worst excesses of Victorian restorers. There may have been a pre-Christian temple on the site, and it is the site of a Roman burial ground. All Saints’ contains much original stonework and has one of the finest Anglo-Saxon towers in the North of England. Inside, effigies date from the 13th and 14th centuries and some interior woodwork dates from 1636. Outside, a statue of the Virgin and Child, defaced at the time of the Reformation, can be seen in a niche above the porch. Parking is available in the designated area of the churchyard, which is also managed as a conservation churchyard. When there is no vicar, the Street parishes are under the care of the Revd. John Warden, Assisting Clergy in the Benefice and Mr Tim Rowe who is the Reader. There are church wardens in each of the four parishes, Appleton with Amotherby; Slingsby; Barton with Coneysthorpe; and Hovingham with Scackleton. (For more information, including contact details) please see the Street Parishes website. Church services vary from week to week with the churches taking it in turns to host the monthly Benefice service on 4th and 5th Sundays. Details are found each month in The Street Newsletter which has a “noticeboard” section which includes secular events within the parishes. It is available at a nominal cost. For many years a group has met in a home in Broughton for a monthly Communion Service. While the Street Parishes are without a vicar, the Amotherby Home Eucharistt is led by Reader Mr Tim Rowe. Hymns are sung and there is a chance to enjoy a chat over a cup of tea after the short service. New members are always welcome. Where needed, transport can be arranged. Ring 690663 if you would like to join/need like a lift. For further details, please check the Street Parishes website. Forthcoming events are also listed on the website. Details on how to contact both the vicar and the reader are published. The website also includes a history of the churches. The photographs are copywright © The Street Parishes and are used with kind permission.